World’s Largest Shuffleboard Club: St Petersburg, FL. 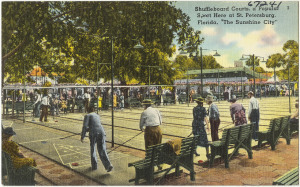 We Celebrated the 100th Anniversary of FL Shuffleboard Here!! As far as hometown superlatives go, possessing the world’s largest outdoor shuffleboard court is ridiculously specific. 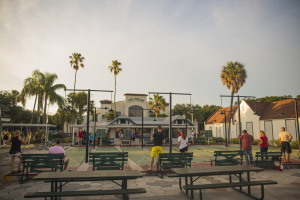 Nevertheless, the shuffleboard club in St. Petersburg represents the story of this Floridian town’s rise, fall, and rise again. It opened in 1924, when Florida was quickly growing into a popular tourism destination. The sight of palm trees and pelicans on a beachy postcard brought many to St. Petersburg in the ’20s. It was a city for leisure—it had one of the earliest baseball stadiums, grand hotels like the bright pink Vinoy had breezy open porches for guests to luxuriate on, and Mediterranean architecture brought the cultured feel of the riviera to the American South. Similarly, shuffleboard was a leisurely sport.